Jemaine Clement and Taika Waititi's cult vampire comedy gets a clever expansion on FX. “What We Do in the Shadows” is the rare TV comedy that can elicit equal excitement with an episode titles like “City Council” (Episode 2) and “Werewolf Feud” (Episode 3). Hell, it’s one of the few that could even offer such disparate titles, and therein lies the excitement. Jemaine Clement’s TV show is alive with possibilities, and keen to find humor in every corner of its idiosyncratic vampire world. In the first half of its debut season, the creator (along with producers Taika Waititi and Paul Simms) moves rapidly through his new characters, setting, and individual plots, building anticipation as efficiently as he elicits laughs. There’s still room to grow, but Clement’s adaptation gets a lot of the finer touches just right, straight off the bat. Shot in documentary-style a la “The Office,” “What We Do in the Shadows” examines the mundane existence of immortal roommates. 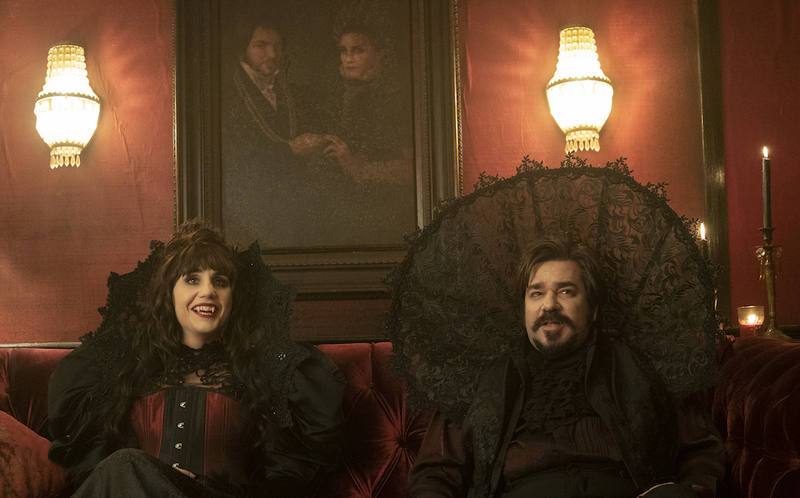 Nandor (Kayvan Novak), Laszlo (Matt Berry), and Nadja (Natasia Demetriou), who have lived together for hundreds of years in an ornate yet dated Staten Island mansion. Helped along by Nandor’s “familiar” (aka a servant who someday wishes to become a vampire) Guillermo (Harvey Guillén), the vampires spend their nights hunting and days sleeping until a surprise visit from an elder vampire throws their existence out of whack. They abide by most of the typical vampire rules: They must avoid the sun. They only drink (and eat) blood (lest they become violently ill). They have fangs, can turn into bats at will, and are able to cast spells on humans to get what they need (or make them forget certain events). Clement also adds a few of his own flourishes: Colin (Mark Proksch), the fourth roommate, is an “energy vampire.” Instead of drinking human blood, Colin “feeds” on their energy by either boring them with a long conversation or enraging them with passive aggressive behavior. He works in a cubicle-laden open office, the perfect buffet for someone who can survive on impromptu drop-ins or by sharpening his pencil for far too long. This is the kind of addition needed to properly expand Clement and Waitit’s original film. When “What We Do in the Shadows” hit indie theaters in 2014, vampire fever was just beginning to wane. The “Twilight” saga was complete. “Let the Right One In” had helped redefine the genre’s arthouse appeal. The time was right for the self-serious bubble around these undead bloodsuckers to burst. Clement and Waititi’s Sundance debut did just that, tracking a documentary crew (protected by crucifixes) as they captured a group of vampire roommates as they fight over chores and go clubbing in the suburbs of Wellington, New Zealand. Over the first four episodes, Clement’s TV adaptation is almost too eager to dig its teeth into the serious, bloody fare that came before. The chemistry hasn’t quite clicked, and the overarching plot — these vampire roommates are tasked with taking over North America — gets in the way of the comedy more than it facilitates it. Sometimes it feels like certain details are rushed in favor of a silly joke, but a) the silly jokes are so good, and b) the intricate craftsmanship evident in the costumes, sets, and over mise en scéne, not to mention the rich world-building and endearing characters, more than make up for a few early bumps. Even when a show is expanded from a confident, fully realized original story, TV needs time to settle into itself. In order to elicit a bit more empathy and attachment to the lead characters, Clement et. al. need to strike the balance between a vampire’s grandiosity and the mundane desires of humankind — but it’s well on its way. There’s a lot to admire in the opening episodes, and the potential within each only drives more excitement for the next. “What We Do in the Shadows” premiered at the 2019 SXSW Film Festival. The comedy will debut Wednesday, March 27 at 10pm ET on FX.